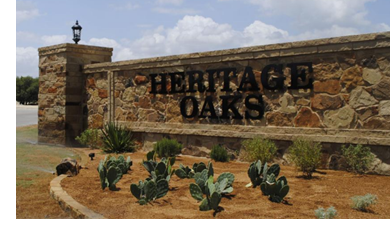 ​​​ ​KILLEEN – Homes are beginning to pop up in the 660-home Heritage Oaks subdivision on Chaparral Rd. near the border of Killeen and Harker Heights. According to Carothers Homes, the homebuilder in the subdivision, the largest homes will cost around $300,000 and be up to 2,000 sf in size. The subdivision is at the intersection of a number of ongoing and future infrastructure projects to expand utility and roadway capacity for incoming residents to that area. Directly to the east of the subdivision, the City of Killeen is in the construction phase of the $5.3 million Rosewood Dr. extension project that will extend the road south to Chaparral Rd. The project will install 0.6 miles of road a 284-foot-long bridge over Trimmier Creek.